They dominated most of the contest, with Jamal Lowe’s early finish added to by a Brett Pitman goal just after the interval. Marcus Bean controversially reduced the deficit for the Chairboys, only for a fine free-kick from Pitman to restore the Blues’ commanding advantage. A super strike from Scott Kashket ensured a nervy end to proceedings, but the visitors held on to secure the points. Kenny Jackett made two changes from the side that beat Sunderland to lift the Checkatrade Trophy the previous week. Oli Hawkins – who had struck the winning penalty in the shoot-out – was rewarded with a start, with Gareth Evans also returning, as Omar Bogle and Ronan Curtis dropped to the bench. There were plenty of familiar faces in the opposition line-up, with Blues academy graduate Paris Cowan-Hall joining former Fratton loanees Ryan Allsop and Bean in the Wanderers team. 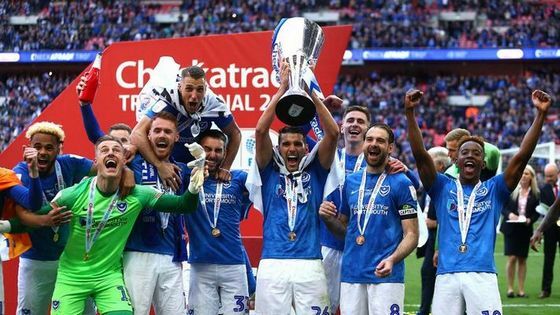 Pompey came racing out of the traps and won a series of early corners that kept the home defence on their toes. The visitors were enjoying plenty of possession and territorial advantage, without being able to test Allsop between the sticks. Pitman did well to race past Dominic Gape down the right and square for Lowe, who spun sharply and curled a shot over. Another neat move saw Hawkins find Lowe with a cross-field pass and the winger laid the ball off for Pitman to fire just off target. Allsop was then called into action for the first time, although was not overly troubled by a drilled effort from Lee Brown. He could do nothing to stop Pompey from taking the lead on 18 minutes, however, as they finally made their pressure count. A free-kick from Evans was not properly dealt with and when Matt Clarke lifted the ball back into the box, LOWE was there to drill it through a sea of bodies and into the net. They did not sit back on their lead, though, and a shot from Ben Close was blocked after Tom Naylor had stolen possession. Wycombe had offered little at the other end of the pitch, but had two great chances to level before the break. The first opportunity came from a 25-yard free-kick after Alex Samuel had been fouled by Christian Burgess and Craig MacGillivray flung himself to the left to push behind Jason McCarthy’s attempt. And the keeper made another fine save moments later, this time to keep out a fierce strike from Cowan-Hall. But Pompey might have extended their advantage in stoppage-time, as Clarke teed-up Lowe for a curling shot that was well saved by Allsop. A second goal did arrive just 27 seconds after the restart, however, as Evans played a dangerous ball down the middle. Anthony Stewart looked like he would deal with it, but PITMAN nipped in to steal the ball and confidently slot it home. Rather then dent Wycombe’s confidence, though, it seemed to spark them into life and the hosts suddenly enjoyed a spell of pressure. And they made the most of it by reducing the deficit through Bean’s close-range finish, although referee John Busby had a lengthy discussion with his assistant before allowing the goal to stand. The Blues were adamant that the midfielder had been in an offside position, although the official seemed to think the ball had come off a white-shirted player. It had been a frantic start to the second period and Pompey had a chance to restore their two-goal advantage when Evans was brought down by Stewart just outside the box. PITMAN stepped up to take the free-kick and curled a fine effort past Allsop’s desperate grasp to spark more scenes of joy in the packed away end. Both teams were looking capable of adding to the scoring as the action continued to switch from one end to the other. Pitman’s pass was cleared before it could reach Clarke at the near post, while substitute Adebayo Akinfenwa headed over. But it took another fine save from MacGillivray to deny the Chairboys on 72 minutes, with the keeper getting down to push clear Samuel’s shot. Pitman received a standing ovation as he made way off the pitch, with Anton Walkes coming on for the closing stages. It was the hosts cheering soon after, though, as Kashket reduced their deficit with a screaming shot from just inside that area that flew into the top corner. Curtis then replaced Evans, as Jackett looked for his side to get back on track, although the Chairboys came close to a leveller when Samuel’s header flashed past the post. Wycombe were given renewed hope when the fourth official displayed six minutes of time to be added on. The hosts continued to try to pump the ball into the Blues box, but the visitors held firm to close the gap on second-placed Barnsley. Brett Pitman opened the scoring from the penalty spot and Omar Bogle made sure it was a commanding lead at the break. The hosts were much better in the second half, but Viv Solomon-Otabor swept home his first Blues goal. The Saddlers did not give up, however, and Jon Guthrie converted two corners – the second right at the death – to restore some pride. Kenny Jackett made three changes from the side that were beaten at Charlton at the weekend. Skipper Pitman replaced Gareth Evans for his first start since the end of January, while Oli Hawkins made way for a fit-again Bogle up front. And with Ronan Curtis suffering a freak injury on the morning of the game – getting his finger trapped in a door – Solomon-Otabor came in wide on the left. Pompey made a bright start to the contest, although Bogle was unable to bend an early shot around Saddlers stopper Liam Roberts. But they were temporarily down to 10 men when Matt Clarke reopened the wound in his head and started bleeding from the nose. The medical team had to patch him up and with the defender requiring a change of outfit, he was stood without a shirt in cold conditions for a number of minutes. It was during that time, however, that the visitors broke the deadlock, with Morgan Ferrier punished for a shove on Nathan Thompson inside the box. Referee Trevor Kettle immediately whistled and PITMAN stepped up to send Roberts the wrong way from the spot. Walsall were struggling to deal with the Blues’ attacks and just about forced the ball clear when Solomon-Otabor tried to convert a mis-hit effort from Jamal Lowe. But the hosts soon had a chance to level when Ferrier raced on to a ball down the right and saw his shot saved by Craig MacGillivray. And the keeper immediately provided the assist for Pompey’s second goal from a long punt up the pitch. The ball reached BOGLE, whose shot appeared to be going over, only to dip on to the top of the post and bounce over the line. Lowe thought he had added a third on 30 minutes after converting a quickly-taken Pitman free-kick, only for Kettle to decide Pompey had acted too soon. Walsall failed to deal with the set-piece when it was played a second time and Tom Naylor’s strike was deflected behind. Pitman then lifted a fine pass over the defence late in the half, although Lowe’s touch was slightly too heavy and Roberts was able to gather. The hosts had been second best throughout the first half, but had a chance to reduce their deficit seconds after the restart. A long ball forward bounced awkwardly for Clarke and Josh Gordon was not quite able to send his header looping over MacGillivray. Gordon’s teasing delivery from the left then had to be headed behind by Lee Brown, as Walsall started to provide much more of a threat. They were pushing Pompey back for long periods, but the defence were holding firm to repel the red-shirted tide before MacGillivray could be tested. Lowe won a corner to offer some respite, but Brown’s cross was headed wide by Bogle to let the Saddlers off the hook. But the Blues did have a third goal on 68 minutes – and it meant that all three of the players Jackett brought into the team had scored. Pitman was falling to the turf as he sent a pass through to Lowe, who unselfishly squared for SOLOMON-OTABOR to slot home and open his Pompey account. Bogle was soon withdrawn by Jackett and had his name chanted by the travelling fans as he trudged off to be replaced by James Vaughan. It looked like it was game over, but Walsall gave themselves some hope when Guthrie nodded in a corner from George Dobson. Pompey appeared to be seeing the game out with relative ease, only for the Saddlers to grab another goal in stoppage-time. Another corner was scrambled into the net by Guthrie, but there was not enough time for them to mount any more attacks and the Blues were able to celebrate a victory. Dennis’ delivery was headed back by Walkes at the far post and PITMAN acrobatically flicked the ball home from close range. And the Blues comfortably saw out the final few minutes to seal the win that ensures their place in Saturday’s third round draw.